Chairman’s Blog – April 2019. RoSPA Advanced Drivers and Riders groups Central & South Devon Drivers (CASDAD) Tim Privett (Chairman), Damian Lee (Training Officer) and Will Stewart (ADI) and Devon and Somerset Advanced Riders (DSAR) Stan Hathaway (Chairman), Andy Phillips (Training Co-ordinator) and Mo Ayling (Associate) had an opportunity to share a training day experience “Precision Perfection” and a combined drive/ride from just west of Okehampton up to Bideford and back. During the pre drive/ride brief a couple of differences in terminology used became apparent: Damian used View Point to describe the point where your view of the road is closed off (DSAR know this as the Limit Point) and the relative positions in the roadway. CASDAD use a numbering system 1-5 which covers the full width of the road verge-to-verge with position 1 being the nearside verge, 3 straddling the paint lines (if there were any) and 5 being the offside verge, whereas DSAR tend to use (informally) only 1-3 or simply nearside, middle & centreline and offside being any part of the roadway to the right of the painted lines, with 1 being the width of one motorbike from nearside edge, 3 being the area of one ‘bike width to the left of the painted lines and 2 being the 1/3rd in the middle (where we tend to find most non-advanced riders), these are not 3 zones of defined operation, just a description. It was also noted DSAR only expect motorcyclists to use the offside if it will give you an advantage in your riding plan and it does not give misleading information to another road user, we use a good SLAP now and again – not physical contact but Safe, Legal, Advantage, Perception in our decision making process. Clearly motorcyclists use a position that they occupy, approximately 1/3rd of the width of your lane, car drivers using the same principle would have a very cosy relationship with their local body and tyre repair shops. It was pointed out that motorcyclists will change position for View (what we can see) Visibility (ensuring others see us) Stability and most importantly being prepared to give up our position for Safety if required, often referred to as V²S². Another point noted was how DSAR (having previously done a ride recce) also include physical hazards and environmental hazards brief which could negatively influence a safe ride (mud on road, recent hedge hacking, diesel spills, corrugated roadway etc) not covered for the 4-wheelers! The drive/ride would be by line-of-sight as the route was relatively straight forward. This did mean if any one motorcycle got an overtake to maintain line-of-sight they would have to ensure the following rider would also be able to do so before any change in direction at the next road junction or be prepared to relinquish your newly won position. It would be interesting to see car drivers do the drop-off system! Some gentle banter ensued about the ‘bikes leaving the cars behind and having to wait to allow Damian to take up the lead again. Time for humble pie… Will shared a lift with Tim in his 6.3 litre AMG Merc whilst Damian made… “Very good progress” in what appeared to be a normal looking SUV. The only times where the motorcyclists had any overtake opportunities were coming out of bends where light weight, quick throttle response and if the circumstances allowed (we didn’t get an opportunity against the AMG). A great lunch at Bideford and a wiggly return journey with a debrief at the end enabled us to compare notes: The need to choose your riding line carefully through bends to ensure Stability and Safety; the likelihood of hospital food or worse following inadvertent encounter with dry mud (slippery as talcum powder) wet mud (slippery as … wet mud), wet road paint / manhole covers (slippery as … wet mud) and the susceptibility of punctured ‘bike tyres when riding over hedge debris or pot holes. Having a view advantage being able to see over the tops of cars and hedges in the preparation phase for any overtake, Damian mentioned he “eased off somewhat to allow us to pass him!” Our side of that little discussion is very different! Either way, a thoroughly enjoyable day breaking a few perceptions but no speed limits. Chairman’s Blog – December 2018. What we have achieved as a group. So, DSAR (yes I know we have a new name but it is toooo long!) continues to grow and we have had an outstanding year with new joiners becoming associates, associates passing the Advanced Motorcycle Test and becoming new members, and members passing their 3-yearly retest to continue their membership, often with improved passes! Well done to all. We have also had a great turnout at the Saturday Surgeries and End-of-Month Rides, including on many occasions proving wet weather does not stop us – “If it isn’t raining, it isn’t training!” The turnout would have been higher still for the November Ride (titled “Environmental Hazards”) if I hadn’t fallen off during the ride recce having failed miserably to notice the sloppy mud down the centre of the minor road and sticking (definitely the wrong word) the front wheel onto the gloop with not entirely unexpected results. Lesson Learned – Sloppy mud has no grip! We have also had a pass-holders weekend away in North Wales where the scenery would have been fantastic if we could have seen it but due to storm Callum it turned out a real test of waterproof clothing and stability in gusty conditions. Notwithstanding the challenging weather, it was a superb ride out. I can highly recommend it for those wishing to do the same again in 2019. A reinvigorated drive to get more new joiners continues – I hope everyone takes an active role here please as this is the cornerstone of our existence! Support for Somerset Road Safety at Fleet Air Arm Museum and another chance to practice slow riding. Saturday Surgeries and End-of-Month rides start early in the New Year, the first are definitely weather dependant as even I don’t take ride out in the snow (let’s not mention taking David Pengelly down the Toboggan Run!) so volunteers are required to lead and sweep. Ride leader and Sweeper Training and Tutor Continuation Training will start early in the season, so keep your eyes peeled on the website for details. Finally, I would like to thank all members and associates of the group for your continued support, and also to thank long suffering partners who “allow” us to escape from household chores so we can train (don’t let them know how much fun we are having!) and improve our riding skills. Have a safe festive break and looking forward to seeing you all sometime in the New Year. I have great pleasure in writing my opening letter as the newly appointed Chairman of DSAR, and a heartfelt thank you to all at the AGM who approved my appointment. Following on from the extraordinary work Dan Mawer has done over the previous years as Club Chairman will not be an easy task, but with support and guidance from you all I am sure we will again make great strides to improving our club, the way we train and support others through theirs and how we project ourselves to the wider riding community. The open system of Training Assessment – using our Senior Tutors to conduct Pre-Test Check Rides which ensures our Associates and tri-annual test candidates are well prepared for the Advanced Motorcycle Test. As a Diploma holder, I am also re-tested on my Tutoring skills at the same time as my Advanced Test. I have heard from many of you your desire to include more refresher training for Tutors and other training outside the remit of the Advanced Test – music to my ears! 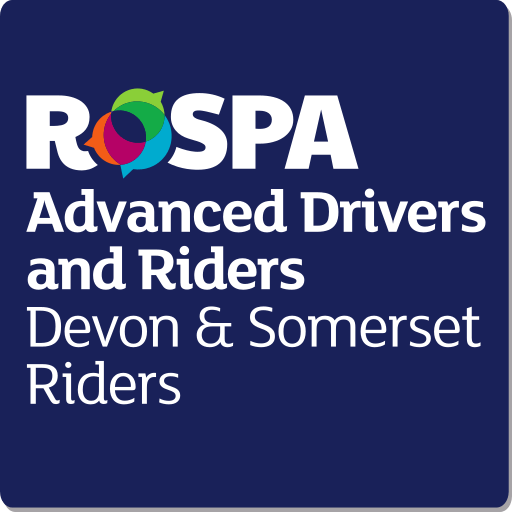 In the coming months I will open discussion how we develop this and utilise the skills of our local and former police riders whom between them hold positions of RoSPA Examiner, Head of Road Safety at Somerset Road Safety Partnership and DSAR Training Advisor and more locally; utilising Dan’s extensive repertoire and my experience to demonstrate “what good looks like from the examiners’ view. At the AGM, Dan mentioned his feeling that we were considered the best motorcycle training organisation in the South West and possibly the UK! This is definitely something we should be proud of and aspire to prove correct. Previously our greatest weakness was communication – We have made great strides in improving the effectiveness of the website and continue to do so. I would encourage everyone to use the website as the primary means of communication, please do consider the content – if something irritates you then talk to the individual concerned or pass it to the committee, or if need be direct to me. Inactivity – Tutors not having Associates; this has been exacerbated due to previously having high numbers of Associates without Tutors, then going through a training programme for new Tutors followed by website problems preventing new joiners from… joining! In 2018 we were able to conduct a dozen Initial Check Rides and get new joiners signed up. We are nearly there where all Tutors have someone to train. In order for the group to maximise on any potential to gain new joiners could I ask you all play an active role in recruitment? Any opportunity to talk to other bikers should be seen as a potential new joiner. So invite other club members or biking buddies or even those who don’t have a bike (could they ride pillion if they have the correct kit?) to our Saturday Surgeries and End-of-Month Rides. As a group we are covered under RoSPA Insurance for non-members provided they have signed the pre-ride disclaimer. Our main competition – IAM Roadsmart, turn up at events en-masse and dominate the visual space. We need to fully support any event where we could potentially gain some new recruits so I would strongly encourage everyone – Tutors / Pass holders / Associates to promulgate any event they know to the Events Co-ordinator. We are going to spend some of our funds replacing the gazebo and advertising boards to help in this programme.